While we fully support replacing good nutrition for Slorgs-- oh wait, Lawyerbot is beeping and running over... what? Oh. Okay. AHEM... while we fully support a nutritious diet that supports your personal food preferences, we acknowledge there was an error made, and that the Neopian Health Foods Store should not be linking to the Shop of Offers. We will endeavour to fix this issue as resources become available. He does. This is why we always keep a Binary to Lawyerbabble to English dictionary on hand at all times. You're quite right. oO We guess we didn't notice that detail. We often get distracted by Meepit invasions. We'll see if the Art Department can fix that during the next lull in battle. No, that would fall under the rule of not providing services in exchange for Neopoints. Sorry about that! Good idea, though. ;D May we suggest a business degree in your future? Oh, it's certainly not random -- otherwise you'd see sparkling photographs of kittens and other bizarre things people submit. When judging, we don't have age information available; we just see cute pictures and pick the ones we like the best. We do, however, try to keep in mind various levels of artistic ability. Just keep at it; sounds like you've just had a bit of bad luck. You can still get the mists from Tarla's Shop of Mystery. STORYTIME! Once upon a time, Dragona was a young college dragon. 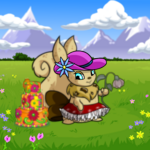 On weekends, she would come home and play a super-fun game she had discovered... Neopets! She loved the site so much that she'd play for hours and hours. Her father, being a kind (but practical) man, said she shouldn't waste her time with such an activity. Even though she assured him that she had learned how to use HTML and was getting a better sense of business and economy, her father wasn't convinced. Then, one day, Dragona applied for a job with Neopets. Eight years later, she now has a career she loves, health insurance, and a nice set of bedroom furniture from selling her company stock. To this day, she and her very proud father still laugh and laugh over the "wasting time" comments he made so many years ago. The End. Hey, that game is harder than it looks! Which Uncommon Faerie Are You? 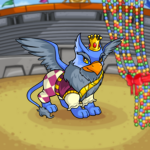 We've all heard the likes of Fyora, Jhudora and Illusen a plenty but what about the other faeries? Take this QUIZ! Little House on Roo Island: Sketchy? 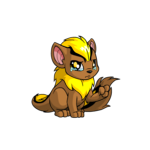 This awesome new avvie is every collector's dream. "He's stricken ill with Neo Flu... again." The Doctor heaved a sigh, casting a pitying glance towards Awtchey. "Poor thing. Happens every year."